Oh…did we mention the FREE pizza? Do you need a place to focus for working on papers or studying for exams? 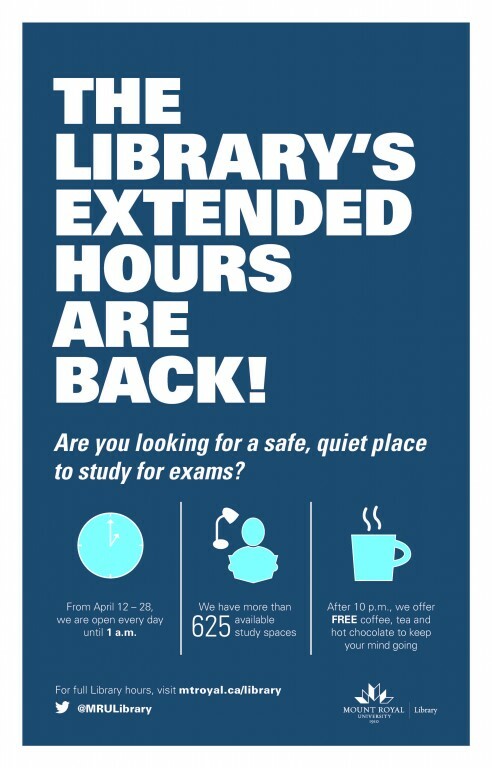 The Mount Royal University Library’s extended hours begin on April 12th and run until April 28th. We will be open Monday-Friday from 7:30am to 1:00am and Saturday-Sunday from 10:00am to 1:00am. Drop by for puzzles and other fun stress-busting activities. 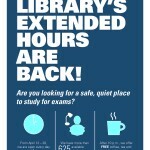 Come see us in the evenings after 10:00pm for some Tender Library Care (TLC) with free hot coffee, tea and hot chocolate! The Library has reconfigured some space to bring you the Library Lounge! This space, next to the library entrance, is an area for relaxing, reading and working. We have lots of soft seating, stand-up computer stations, and outlets for you to plug into. Our paperback collection, Zine collection, and our Just Arrived books are there for you to browse and borrow. Our current newspapers and a selection of current magazines are there as well. Come on in and relax! Due to a water main break overnight, the main MRU building, including the Library, is currently closed. We hope to open the Library at 9 am when access to the building is restored.